Organisational learning requires continuous assessment of organisational performance, looking at successes and failures, ensuring that learning takes place to support continuous improvement. The After Action Review (AAR) is a simple option for facilitating this assessment. It works by bringing together a team to discuss a task, event, activity or project, in an open and honest fashion. The systematic application of properly conducted AARs across an organisation can help drive organisational change. As well as turning unconscious learning into tacit, it helps to build trust among team members and to overcome fear of mistakes. When applied correctly, AARs can become a key aspect of the internal system of learning and motivation. There are many different ways to conduct AARs. The simplicity at the heart of the tool means there is much potential to experiment with the process and find the right ways that will work best with the group and the work item under review. The whole process should be kept as simple and as easy to remember as possible. The essence of the AAR is, however, to bring together the relevant group to think about a project, activity, event or task, and pose the following simple questions. These questions establish a common understanding of the work item under review. The facilitator should encourage and promote discussion around these questions. In particular, divergences from the plan should be explored. These questions generate reflection about the successes and failures during the course of the project, activity, event or task. The question ‘Why?’ generates understanding of the root causes of these successes and failures. This question is intended to help identify specific actionable recommendations. The facilitator asks the team members for crisp and clear, achievable and future-oriented recommendations. What was your plan to achieve this? What advice would you give yourself if you were to go back to where you were at the start of the project? What next for you in terms of this project? Can you think of a story that summarises your experience of work on this project? Are there any lessons for you personally? This workshop was a consolidation of a number of country-level learning activities following the crisis caused by the tsunami of 26 December 2004. The AAR focused mainly on the four most affected countries: Indonesia, India, Sri Lanka and Thailand, with additional participation by staff from CARE Somalia. The primary purpose was to explore ways in which participant organisations could jointly improve their performance and quality of work by reflecting back on their activities and actions. It presented an opportunity for participants from various organisations to discover for themselves what happened and why, and how to build on strengths and improve on areas of weakness, as well as exploring ways in which they might collaborate more effectively together. The use of humanitarian standards such as Sphere. The importance of preparedness planning, notably the need to build local capacity for emergency response. Time was then spent action planning on how to work collaboratively on the first three of the lessons learned. Participants returned to their countries with plans for how to take forward the lessons from the workshop collaboratively. Reflecting on the workshop, participants said that as the starting point for a longer process of collaboration, it had been very useful. Participants generally felt that it had helped in reinforcing closer working relationships between NGOs; many suggested that the process should be opened up to wider representation, not only from different organisations, but also from outside. It was also anticipated that the outputs of the workshop would be a valuable input into the planned multi-agency evaluation and other emerging projects and working groups. AARs can be conducted almost anywhere, and will vary in length. For example, a 15-minute AAR can be conducted after a one-day workshop, or a much longer meeting could be held to reflect on the strategy development process throughout a large organisation. AARs should be carried out immediately, while the team is still available and memories are fresh. It is recommended that AARs be incorporated at key points during a project, activity, event or task in the early planning stage, although they are often completed at the end. Participants of an AAR should include all members of the team. A facilitator should be appointed to help create an open environment, promote discussion and draw out lessons learned. Post the questions up on flipchart sheets prior to the session, with answers then written on the sheet as the session progresses. The completed sheets can then be stuck up around the room to serve as a reminder of the progress. Participants are participants, not a passive audience. The facilitator should prepare leading questions and may have to ask it of several people. The questions can be asked on an individual or a team basis. The team mechanism is ideal, but if suggestions are slow coming, the facilitator could go around the room asking each individual to express one thing that worked and one thing that did not. If there are issues with either openness or time, it may be worthwhile to gather ideas first and then facilitate the discussion in the group environment. Ideally, an uninvolved note-taker should be asked to minute the session. This will enable better capture of the learning. Collison, C. and G. Parcell (2001) Learning to Fly, Oxford: Capstone. 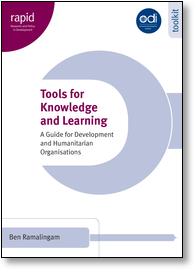 Whiffen, P. (2001) ‘Seizing Learning Opportunities at Tearfund’, Knowledge Management Review, November/December.